What An Amazing 2012, Big Things To Come In 2013! Thanks to our amazing friends, sponsors, partners and a special thanks to you! 2012 has been Project DC Event’s coming out party. 2013 will be the year that we not only grow as a company, but also spread to different cities for more people to hear about our brand, our events, and jump on board for all of the crazy madness that we have in store. But before I go on and start to ramble about the future, I want to give many thanks to our friends, sponsors, partners, and the amazing volunteers we’ve had throughout our events. They have, without a doubt, enabled us to be where we are today. 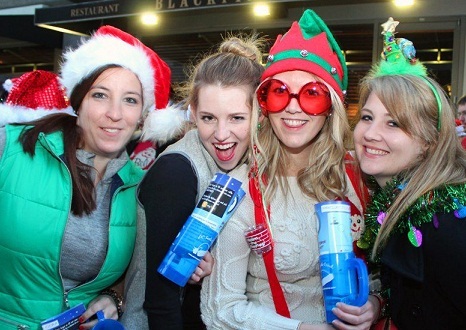 We are thankful for Summer Crawl DC (our coming out event) and for DC Santa Crawl (our biggest event to date). We are thankful to have the best sponsors and establishment partners in the city, and we are thankful to have met you and had you at one of our events. We take pride in going above and beyond in every event we put together and host, and that won’t stop in 2013. We have a lot of tricks up our sleeves for 2013. Mapping out the year, thinking of concepts to bring to DC, as well as brainstorming new cities to throw events in was a blast. Cupid’s Bar Crawl, Pink & Drink and Bright & Pint are just a few events to keep an eye out for in this new year! Don’t forget, we treat our returning participants very very well. You will be among the first to hear about each event and have the advantage of using early bird promo codes! Once again, from Project DC Events to you and your family, Happy New Year! May 2013 be a great and prosperous year for everyone! We look forward to seeing you and partying with you real soon! Go from What an Amazing 2012, Here’s to an even better 2013 back to the Project DC Events homepage.